Vince Velasquez gets the start today against the Marlins. Happy Labor Day! Do you know where your team is in the National League East standings? The most likely answer if you're reading this newsletter is second place, four games behind the Atlanta Braves after a couple of lopsided losses over the weekend to the Chicago Cubs. The Cubs won the rubber match of the series Sunday by an 8-1 score and became just the second team to hit three home runs in a game off Phillies ace Aaron Nola, who had allowed just two home runs in his previous 12 starts. As Monty Python advises at the end of Life of Brian, always look on the bright side of life. You're probably off today, the Eagles will open their season Thursday, and if you're so inclined, the Phillies will be back at it again this afternoon against the Marlins in Miami. You're signed up to get this newsletter in your inbox every weekday during the Phillies season. If you like what you're reading, tell your friends it's free to sign up here. I want to know what you think, what we should add, and what you want to read, so send me feedback by email or on Twitter @brookob. Thank you for reading. Rhys Hoskins believes there’s still time for the Phillies to catch the Atlanta Braves. Pay no attention to the ugly back-to-back losses to the Cubs. Look only forward. That was the message the Phillies conveyed after Sunday's game before they boarded a charter flight to Miami. "I think we're focused on Miami," Rhys Hoskins said. The Phillies will attempt to win their first series in a month when they play the Marlins. The last time they won one was at the start of August when they swept a four-gamer at Citizens Bank Park. "Am I surprised, yeah, because I know that we're a better baseball team than that," Hoskins said. "We've played better baseball throughout the year. Seems like we've had some bad luck, balls haven't bounced our way, we haven't played as good baseball, but that happens throughout the course of a year. I think the good teams find ways to bounce back, and I know we still have plenty of time to do that." It needs to start against the last-place Marlins. While the Phillies are playing Miami, the Braves will be locked in a three-game series with Boston, the team with the best record in baseball. The Braves will then travel out west for four games against Arizona and three against San Francisco. The Braves lost two of three to Boston earlier this season and went 2-4 on their last western trip. This could be a chance for the Phillies to make up ground in the standings. Aaron Nola looked like his usual dominating self early against the Chicago Cubs on Sunday, but it turned into a rare hiccup for the Phillies ace as he allowed three home runs in a game for just the second time in his career. Slugger Justin Bour returned to the active roster Sunday after missing time on the disabled list with an oblique injury. Today, he'll return to Miami, the place he called home before being traded to the Phillies last month. He does not anticipate being overly emotional about his homecoming. Manager Gabe Kapler thought he was about to see something special when Nola struck out seven of the first nine Cubs he faced. Instead, the manager saw another series loss, and my column describes how this once-promising season could also be losing its steam. From our Sunday Inquirer section, I wrote a story detailing how former scouting director Marti Wolever hit the jackpot in his final draft with the team in 2014. Wolever landed Nola and Rhys Hoskins in that draft. Scott Kingery was mostly a second baseman in the minor leagues, and he has mostly been a shortstop in his rookie season with the Phillies. What does his future with the team hold? Our Scott Lauber says the Phillies still are not sure. In case you missed it Saturday, Austin Davis' cheat sheet was ejected from the Phillies' 7-1 loss against the Cubs because umpire Joe West thought it might be defined as an illegal foreign substance. Turns out, using a cheat sheet is not cheating according to Major League Baseball. Today: Happy Labor Day! Vince Velasquez works series opener in Miami, 1:10 p.m. Tomorrow: Jake Arrieta vs. Trevor Richards, 7:10 p.m.
Wednesday: Nick Pivetta vs. Sandy Alcantara, 7:10 p.m.
Thursday: Off day in the Big Apple. Friday: Start of three-game series vs. New York Mets at Citi Field, 7:10 p.m.
Vince Velasquez will start against the Marlins this afternoon in Miami. 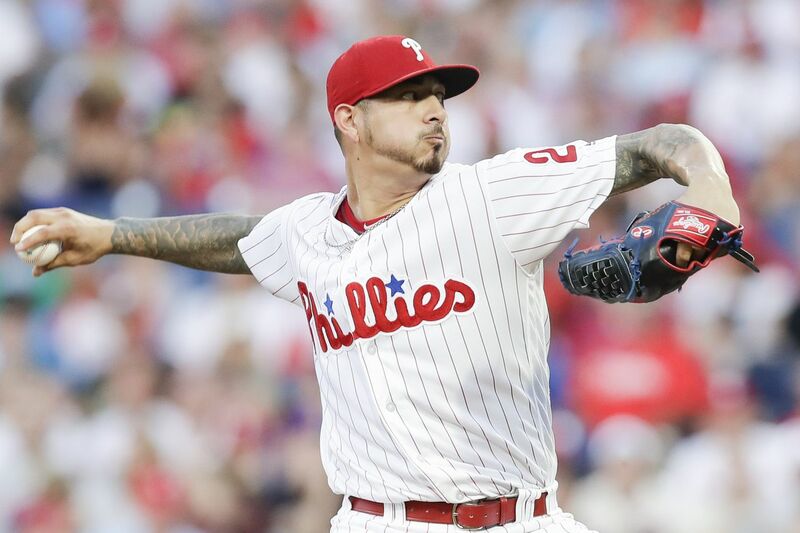 Righthander Vince Velasquez will get the start today in Miami and he might not be the guy you want on second base representing the tying run in the ninth inning, but he is definitely the guy you want on the mound against the Marlins in a must-win situation. Velasquez has dominated the Marlins this season and during his career. He is 4-1 with a 2.25 ERA in eight career starts against the Marlins, including 2-0 with an 0.73 ERA in two starts this season. In those two starts this season, he has allowed just eight baserunners in 12 1/3 innings and struck out 13. Send questions by email or on Twitter @brookob. As a Washington D.C. resident and a lifelong Phillies fan, I would like your opinion on the Phillies' possible acquisition of Bryce Harper. Here in D.C., Harper is considered a prima donna, and definitely not a team player. (Bat throwing, not running out the ball.) Dusty Baker was quoted about the Nationals that they are nine separate players. I think that what makes the Phillies so good this year is that they are a team. Personally, I don't want to see Harper ruin that dynamic. What is your opinion? Answer: Thanks for reading, Eileen, and you've presented a fascinating question that I'm sure Phillies general manager Matt Klentak mulls over quite often. Harper certainly can be a polarizing figure, and he is not having his best season. That said, he is still having a better offensive season than any player on the Phillies roster. What I would do first this offseason is call the Los Angeles Angels and see if they have any interest in trading Mike Trout two years ahead of his potential free agency. If the answer is no, then I would definitely try to sign Harper.